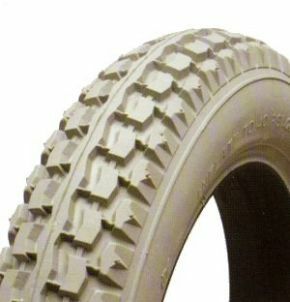 Heavy Duty Power Tyre For Manual And Electric Chairs. 12 ½" x 2 ¼"
Now fitted and allowing my mother in law to do wheelies!! Apart from the fact that I ordered the wrong tyre the service was excellent and the refund swift. An excellent service from beginning to end, many thanks. The tyre and inner tube were first class items, absolutely no problems, The whole procedure of buying them was very easy and the delivery was quick too. Finding replacements for an older type wheelchair was a real headache until I discovered The Active mobility centre's website, I wont hesitate to use this site again, or recommend it to others, many thanks Mr. A. Ford. Good quality tyres but the inner tubes not so good. One blew out after only three days. service and delivery excellent can't fault the company would recommend and use again.